Carter House is believed to be one of the oldest buildings on St David’s Island. The house, situated on the site of the former US military base, was constructed circa 1640 by the descendants of Christopher Carter. He was one of two crew members of Sir George Somers’ shipwrecked Sea Venture who remained in Bermuda when the survivors left Bermuda for Virginia in 1610. 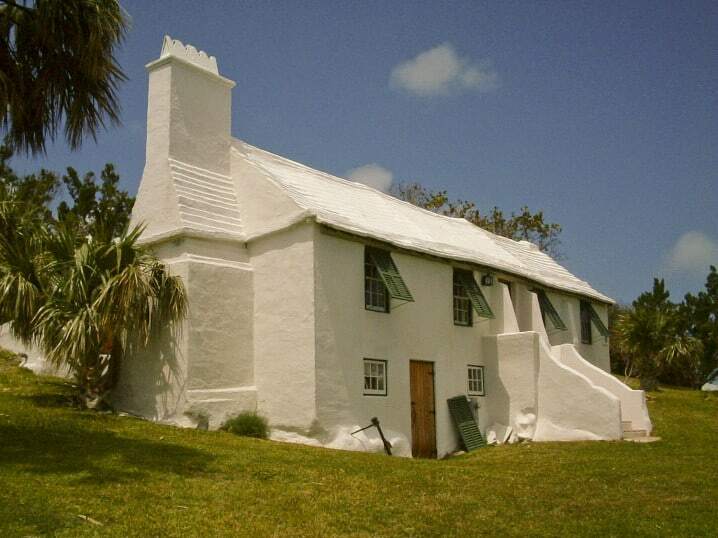 It is a typical example of early Bermudian vernacular architecture. The upper living level rests above a lower basement and is reached by an outside staircase. The gable ends are supported by large chimneys and the whole building is set into a hillside to protect against the elements. The builders of the time certainly knew what they were doing. Over the years, the building has withstood many hurricanes, including storms such as Fabian in 2003 which caused severe damage to many modern structures. When the US military were here, Carter House was used as a beauty parlour. These days it accommodates the St David’s Island Historical Society Museum. Inside you’ll find a fascinating collection of artefacts relating to the history of St David’s Island and its people. In 1612 the first official settlers arrived in Bermuda. The party of 60 was sent by the Virginia Company of London aboard The Plough. A village of palmetto-thatched wooden huts was built and was named New London (subsequently renamed St George). In 2012, to mark the 400th anniversary of the settlers’ arrival, the St David’s Historical Society built an authentic replica of one of the first dwellings adjacent to Carter House. It was constructed using the same building techniques and materials that would have been available at the time. The society hopes it will eventually house a museum. The society has also made serious efforts to create an authentic setting for Carter House. Endemic and native trees such as Bermuda palmetto, snowberry, cedar, and olivewood have been planted in the land around the house. Carter House is situated on Southside Road on St David’s Island in St George’s Parish. To reach it by public transport catch bus number 6 from St George. Visitors travelling by scooter can park for free outside the house. In the summer the house is open Tuesday, Wednesday, Thursday, and Saturday. Opening times are 10 am to 4 pm. In the winter months it’s open on Saturdays only (10 am to 4 pm). Admission is just $2 (free for children under 12). While you’re in the area why not check out some of the other attractions on St David’s Island. Places to visit include Cooper’s Island Nature Reserve, Clearwater Beach, Turtle Bay, St David’s Lighthouse, and Great Head Park. Map showing location of Carter House. My ancestor (Stephen Hopkins) was one of the men who was shipwrecked from ‘Sea Venture’ on Bermuda Island. It’s amazing I am able to see through the Internet how he lived because of your efforts to respectfully keep this amazing piece of history alive. Thank you! I’ve just read an article in the Royal Gazette about Carter House. The St David’s Historical Society has applied for planning permission for the settlers’ dwelling to become a permanent structure. 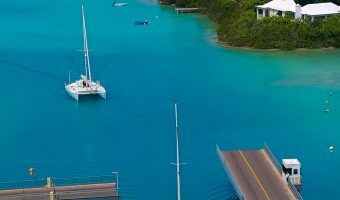 It was built a few years ago to mark the 400th anniversary of Bermuda and has now become a popular attraction. 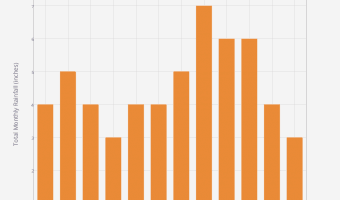 It has also proved to be more robust than expected. My family lived in Bermuda when I was a kid and we loved it there. Our dad had a band while we were there (Air Force) and it was called The Rebels or Woody and the Rebels. Been trying to locate pictures of his band about 1960 to 1963. Hope they are there. This is a very beautiful building but its very out of the way. You need a scooter to get there. I wouldn’t say its interesting enough to justify a taxi fare. The house is a classic early Bermuda vernacular structure and certainly in a beautiful setting. It houses a museum exhibiting the history, people and culture of the unique St Davids islanders. It has the best exhibit of Palmetto products in Bermuda (a dying art) as well as 18th century tools. The Settler’s dwelling c. 1612 is up and is a replica of what they would have built in St Georges in 1612 using the same local materials/English techniques and tools of the time. A fascinating structure well worth seeing. The gardens contain over 40 endemic or native species of plants and trees. Carter House and grounds plus the thatched cottage is like it really was in early Bermuda.